About a week ago, I received some grump-inducing news. As is my recent habit, come afternoon, I plunked down before my desktop and slapped my fingers on the keyboard. Writing time! That day, though, I glared accusingly at my computer, which, just hours ago, had delivered some pretty obnoxious information. But slowly, peck by peck, all the while sighing and muttering angrily, I penned a little over 1000 words. After limping across the finish line, I’ll admit I felt pretty smug. I hated the world that day, and still I managed to write something. I deserved a medal, or at least a merit badge. 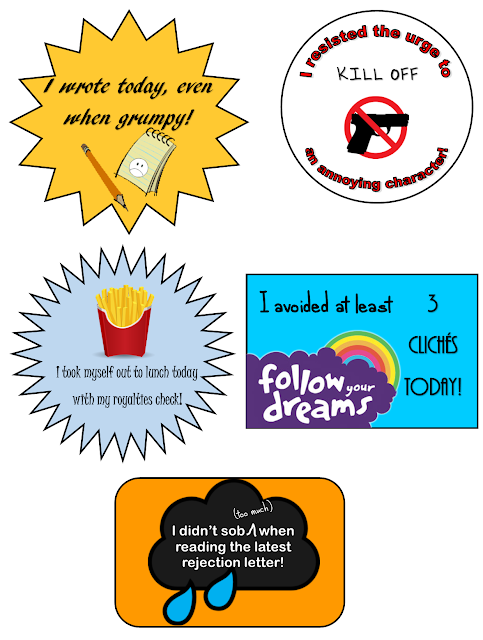 An author merit badge. You know those adulting awards that show up from time to time on social media? I propose we authors have our own adulting award but for, you know, literary stuff. Given this, I have designed some awards. Please feel free to print out, distribute, or tattoo as needed.